Have any of you watched the anime of Himouto Umaru-chan? Or perhaps did you read the manga? If you watched the anime, there’s a high chance that you’ll say this anime is a cute comedy anime with light tone. Though if you read the manga, you might notice that the tone is different. I admire the anime adaptation, but it’s not as good as the manga if I do say so myself. Doga Kobo did a fair job adapting it into a very good show, but not an accurate one. I will cover the review of the anime later. Now, I want to talk about the tone of the manga. 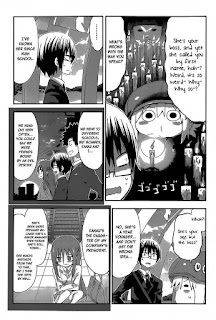 If you have eagle eyes, you might notice several underlying content that is properly hidden beneath the cutesy-flavor of the manga. This topic might’ve been talked about numerous times, but I just want to get this off my chest for the longest time now. 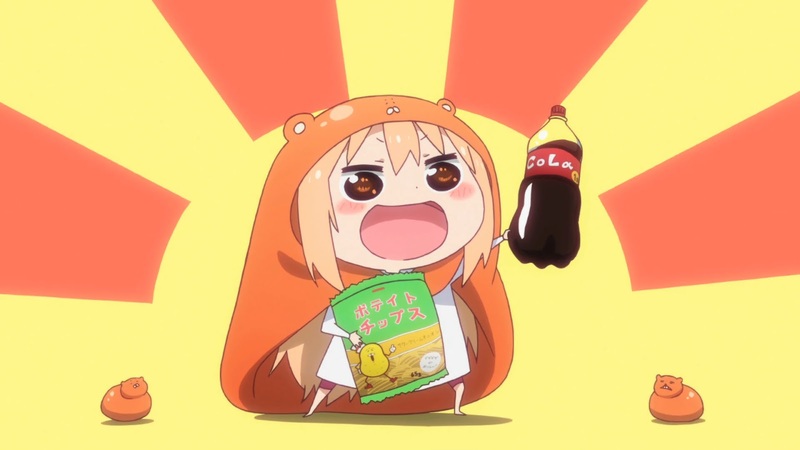 I noticed several facts about Himouto Umaru-chan that wasn’t properly adapted into the content. Probably to hide it’s serious tone in favour of a more light tone. 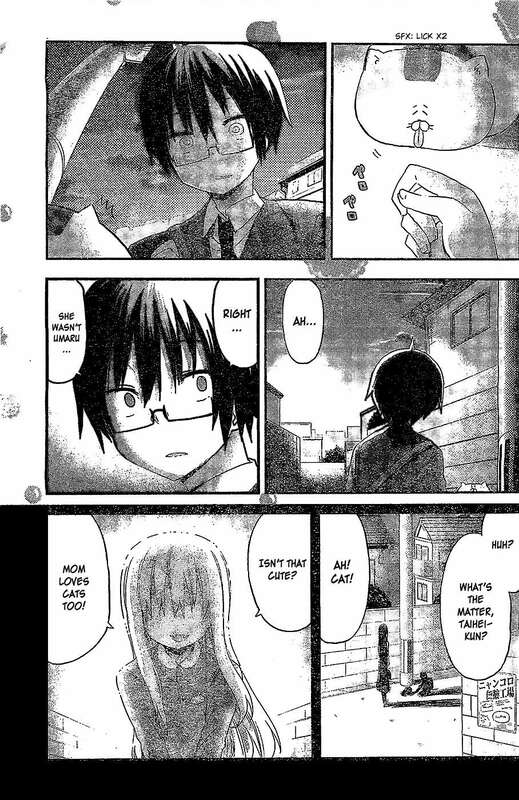 Though, I first noticed this when I watched the anime, and when I checked the manga, it was totally different. This might’ve been answered in the manga’s further chapter [I was able to read up until chapter 64, sadly, this manga is yet to be published in my country] But, I’ll just talk about it. This picture shows that Taihei’s eye shows a more bleak look instead of the normal one in the anime. Perhaps he remembered something bad about her mother? And check out what his mother was saying. “What’s the matter, Taihei-kun?” Notice the usage of honorific –Kun here. In my experience, I never saw any manga or anime that has a mother called their son with –kun. TvTropes explainedthat –kun is used to denote familiarity or endearment. This article made by Sljfaq also stated that it’s usage is informal. If you use –kun, then you know you are close to this said person, but are somewhat detached. This article by Owlocation even stated that the usage of –kun is “Where things get personal and friendly”, so using it on your own son is really improper. In this case, it’s really recommened to use the honorific –Chan to call your child, even if the target is a boy. So what does this mean? My theory is that. Taihei Doma is either an adopted family member, or her mother marries to Taihei’s family. Though with the mother shares an uncanny resemblance to Umaru, we can safely suggest that it was Taihei who was adopted. I have a perfect example for this. In Persona 4, Temperance Social link. Eri Minami, a wife to a man who was widowed, calls her son Yuu-kun, with the child acting all too-rebellious towards her. And Clannad also has this example. Tomoya, the protagonist, is irked by the way his father called him "Tomoya-kun", which he mentioned that his father "No longer considers me a son, but an acquaintance"
And this wasn’t lost in the adaptation too. In both the anime adaptation and manga, she says the exact same thing. By the way, her next line also indicated something similar too. She said “Mother loves them too”. This indicates clearly that her mother right now is trying to get close to Taihei instead of having a casual talk with her son. So Taihei is an adopted family member, that much we learned. What then? Well, this is also highly-apparent when Umaru first came into his apartment. 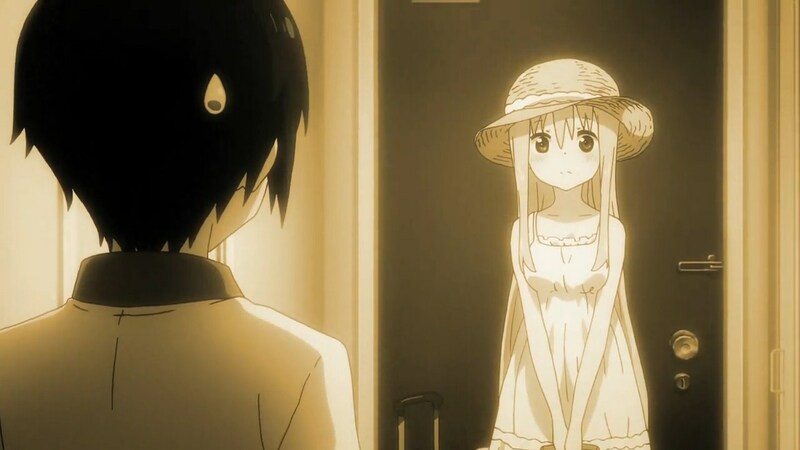 At first, she wasn’t a himouto. In fact, she was as polite as she can be. Her antics here is comparable to someone who is staying to a friend’s house, instead of someone staying in a family house. Though she gradually becomes himouto as the story starts. She even looks detached to him when she first saw him. Sounds very intriguing, eh. I too was excited when making this article myself. In another chapter, where Taihei is going on a business trip, Umaru secretly follows Taihei. At first, she mentioned that she wanted to just eat eel. But, this particular scene where she keeps asking him about who is Kanau, she looks rather like a girl asking a boy about his crush, instead of a sister asking her brother about his crush. And her reaction even sums it up. Last but not least, is this picture during Umaru’s childhood. Look at that smile. That is a bit off in my opinion. 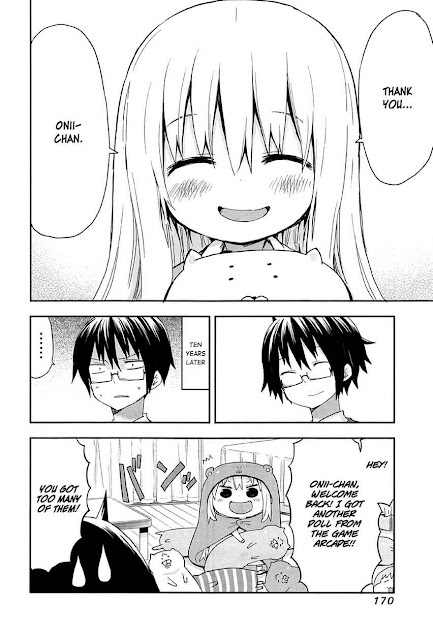 It doesn’t look detached, but Umaru is acting in a way that Taihei is not her biological brother. Usually, when you are given a gift by your older brother, as a sister, your should be smiling from ear to ear. But, this is… It’s not that. She just showed a thank you smile, that’s all. 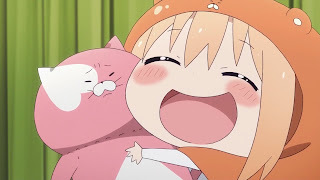 Enough about Umaru and Taihei! Let’s move to another character. Ebina’s crush to Taihei is as clear as a sunlight. She was blushing all the time everytime she meet him. But, what if I told you that there’s an important scene in the manga that was adapted out, where her crush to him is all but confirmed? 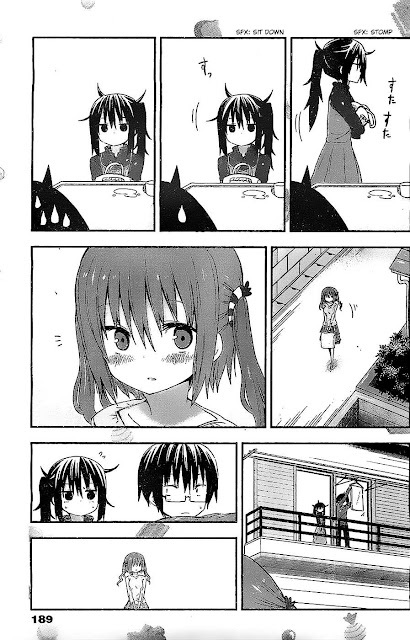 Notice Ebina’s look and her empty look in the last panel. 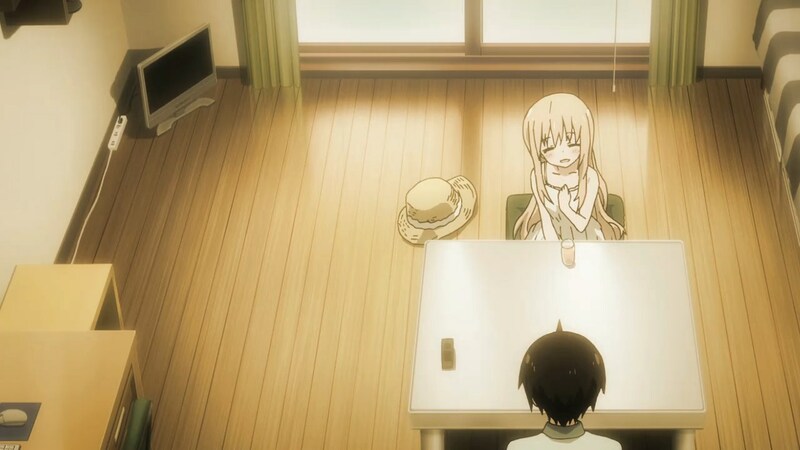 She was concerned whether there was a special relationship between Kirie and Taihei and for a moment, she was stunned. Though Kirie later clarified that nothing’s going on. 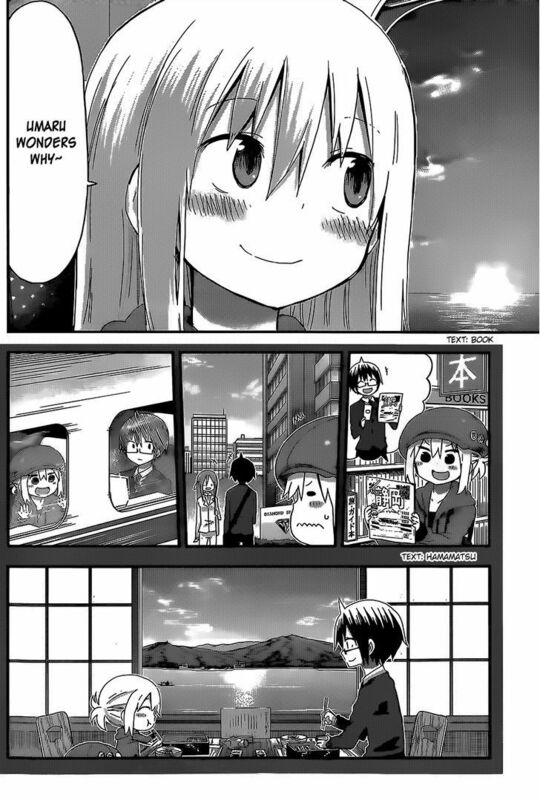 It might look simple, but by adapting this important page out of the anime adaptation, it’s just shows how much the anime is leaning towards the safe zone and Dogakobo just want to adapt a cute slice-of-life story. Those evidences that I found might be the only evidences I have right now. Frankly, I forgot about some more evidences as this was brought up to me also a year ago, not yesterday. My memory is never good, as I suspect that I might have a dementia, good thing I kept a note to write it down and saved several screenshoot of it. Well, that’s all I can say for now. Thanks for reading it. Again, this might've been touched up in several forums or talk, but i just want to voice my reasons and give my evidences. I’ll be posting my review for the anime adaptation of Himouto Umaru-chan after I posted my review on NEW GAME! This week. Then, perhaps I’ll talk about something else. Until then, see you later!